the horizon. Glass railings are a great choice for the back deck, as see-through outdoor railings let you enjoy an uninterrupted view while making family memories. While you might think that old fashioned railings are cheaper, that is not the case. Glass railings are an affordable way to enhance your back desk, where so many special moments are shared with family and friends. Although glass railings are not significantly costlier than conventional railings to install, they do demand a general contractor with experience installing them. That stated, it is possible to do it yourself, but you will need special caulk, tools, screws, and cleaning products to successfully install your railings. If you opt to do it yourself, you will want to purchase glass railings that come with clear instructions and professional blueprints. You will also need to make certain that you order railings that fit your deck. The backyard is the place for the family get together! From backyard barbecues to Thanksgiving Day football games; parties, showers, and homecomings, the backyard is the outdoor hub of your familial life. Glass railings accentuate the significance of it all; enhancing all those photo opportunities and showcasing the grandeur and beauty of the scenery that surrounds. Outdoor railings made from glass are a wonderful addition to any home. 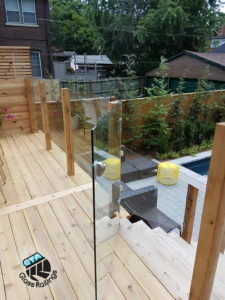 If you are considering adding railing to your deck, think about going with glass.